First, the Billion Dollar Club (BDC) is nearly evenly split between Consumer and Enterprise companies, as the table below shows. I’ve noted the median dollars raised, the median valuation and the valuation efficiency in the table. The valuation efficiency is the valuation divided by the capital raised. 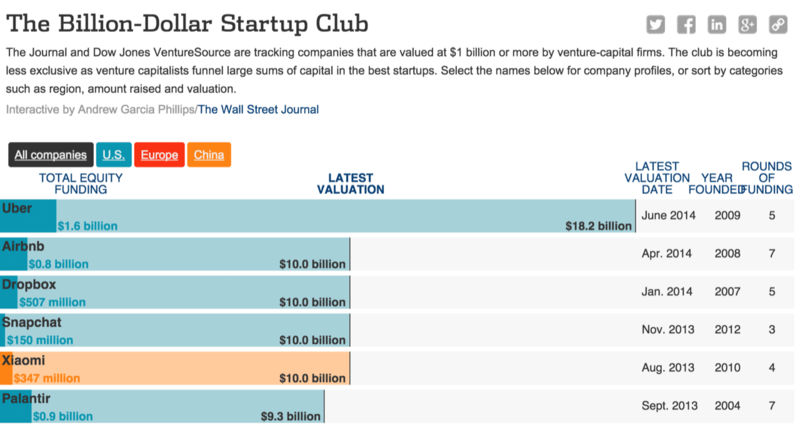 This metric tries to answer the question, how much capital did the startup need to raise to achieve that valuation? This is a somewhat flawed metric but I’m going to use it to compare the relative attractiveness of sectors. 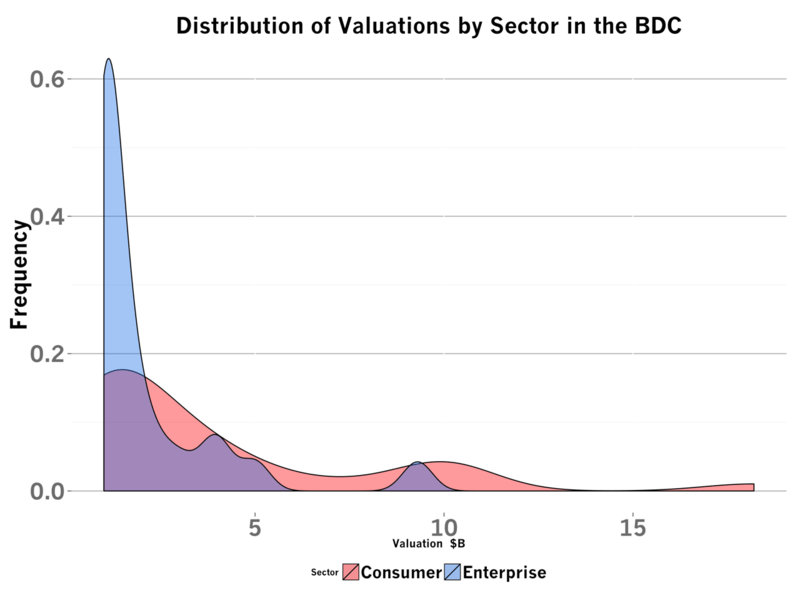 Despite similar representation in the BDC, the median valuation of a consumer company is 67% higher than that of an enterprise company. In fact, 60% of enterprise companies in the group have valuations below $2.5B, as the frequency chart below shows. On the other hand, consumer companies command substantially higher valuations due to faster growth rates and greater revenue opportunities. Next, let's investigate the Consumer and Enterprise components a bit deeper. I've categorized each of the companies in the data set by hand into subsectors and run the same analysis as above to surface material differences across sub sectors. I categorized consumer companies into four buckets: Consumer Services (e.g., Spotify, Evernote, Airbnb), ECommerce (JustFab, Fab, Gilt), Hardware (Jawbone, Xiaomi), and Social Media (e.g., Snapchat, Pinterest) Consumer services and Ecommerce constitute the bulk of the Consumer BDC. But the real story are the social media companies who raise substantially less capital to achieve the second highest valuations. Again, this is a result of the fast growth rates, massive user bases and huge monetization opportunities in this segment. The hardware category's median valuation is heavily influenced by Xiaomi, a super-fast growing Chinese mobile phone company, whose last valuation pegged the company at $10B. let's analyze the enterprise data, similarly broken down into these categories: big data (e.g., cloudera, hortonworks), financial services (e.g., stripe, square), infrastructure (e.g., mongodb, nutanix), saas (e.g., newrelic, insidesales), security (e.g. good technology, cloudflare) and storage (e.g., pure storage). Big Data companies have raised more capital on median than any other category by at least 2x. Cloudera skews this figure, but it's indicative of the capital requirements to sell products in this very competitive market. The Financial Services companies Stripe and Square record high valuation efficiencies likely because their customer acquisition strategies are developer and SMB focused, which excises the high cost of enterprise sales and positions them more for consumer-like customer acquisition. I was curious which companies recorded the highest valuation efficiencies. The table above lists the top four. Interestingly, these companies all serve different markets: Consumer Services, space travel (Other), Hardware, Financial Services. This indicates to me that it’s possible to create massive businesses in many different categories. It’s fascinating to look at the paths created by the members of the Billion Dollar Club, if nothing else but to inspire us to what we could achieve. The valuation efficiency metric is flawed for many reasons. First, it makes assumptions about why startups raise capital. Second, it assumes that all valuation to revenue multiples are similar (which is not true). Third, it catches companies at different points in their growth trajectories. A better metric would be venture dollars required to achieve a certain level of gross profit. But we don’t have that data, so I’ll use this as a low-grade proxy. This analysis suffers from survivorship bias, because all the companies here are “winners” and the data from their competitors or other entrants who didn’t succeed or haven’t yet succeeded aren’t included in the sample set.